How can I keep my dog from chewing my shoes? New Orleans, the dog friendly city! New Orleans is a fun place for humans and dogs alike! Not only do many people living in New Orleans have dogs, but they treat them like royalty. You will see dogs every where including in stores, restaurants and bars. Some of them will be dressed up, some will be pushed in decorated strollers. 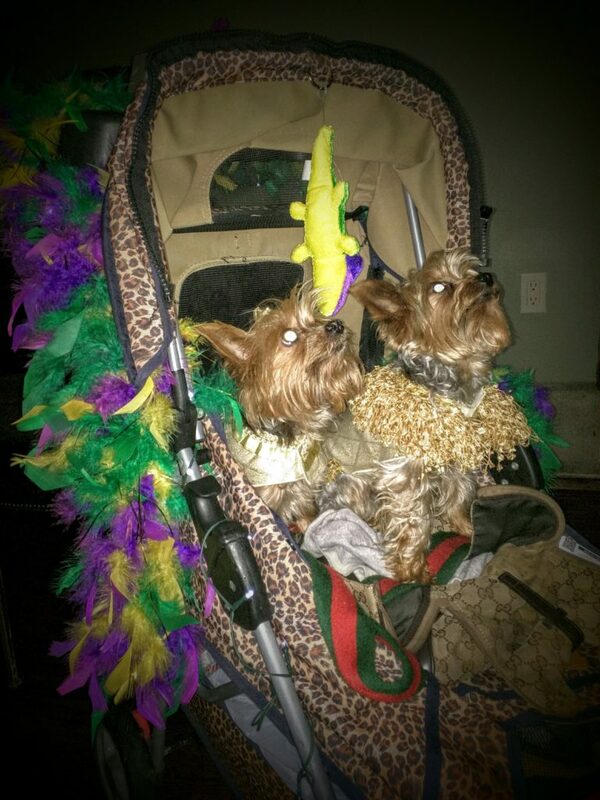 The owner of these two dogs told he decorates the stroller according to the season. This was the Mardi Gras decor. I met him and his dogs in a nice restaurant in Marigny and nobody but me seemed to notice anything unusual! If you do take your dog to New Orleans, be sure it’s not too hot – the summer months can be very warm – and be sure to teach your dog not to eat random stuff off the sidewalk before you go!